My food envy hit an all time high when I saw this post from Vegan Good Things, seriously! I've always wanted to go to New York, but my want has turned to need just so I can go to this Foodswings place. It looks fudging amazing. The main thing that caught my eye was the chili cheese dog, I never, ever have hot dogs because I don't really like veggie sausages, but if it's covered in chili and cheese, I'm game. I've also decided that this ASDA meat free Lincolnshire sausage mix is the least offensive of the fake sausage bunch (for me anyway) and it's only 82p, so as I still had half a bag to use up I got my chili cheese dog on and stuffed my face with delightfully bad food. Heat the olive oil in a pan, then add the onion, garlic, red pepper, chili powder, paprika and cumin and gently fry for 5-10 minutes or until the onions are translucent. Add the veggie mince and fry until it is cooked through, then add the tomatoes, vegetable stock and tomato puree and leave to simmer for 30 mins. While the chili is simmering make the packet sausages (if using) and when there's 10 minutes of chili cooking time left start frying the sausages. 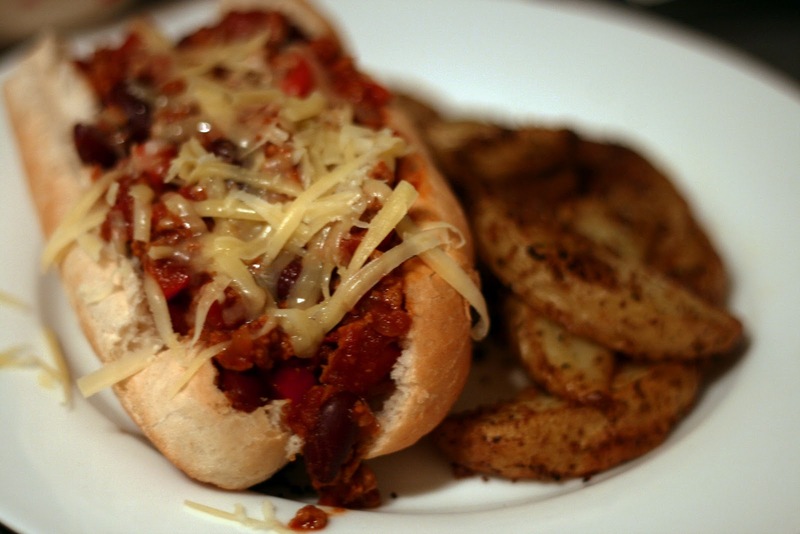 When the sausages are browned, place into the sliced submarine rolls, top with the cooked chili and cheese/vegan cheese, serve up with crispy potato wedges and enjoy!